Coming to the point of a deep cycle battery, it is a special type of battery used by sea boats and navy. 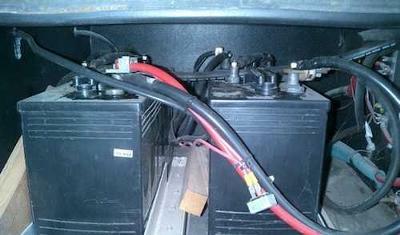 The specialty of this battery is its particular maintenance needs. To recharge recycle batteries adequately, a multiple stage deep cycle battery charger should be used. A large numbers of charge and discharge process required in order to attain its maximum storage level. The deep cycle battery is constructed in such a way that it requires to be discharged to a great extent and then fully recharged again several times in its service periods. It is advisable to use a multiple stage charger of good quality ranging from 8 amps to 16amps output. With the facility of a built in “float mode”, the deep cycle charger charges the marine battery completely for an extended period of time even when not in use and the service life of the unit increases considerably. Even a newly purchased deep cycle battery requires an initial first charge prior to put into service. Practically a new battery requires to undergo about twenty to fifty charge/discharge phenomena before attaining full storage capacity. You have to bring the battery under control within this period and take care not to get the battery fully exhausted. By doing so the service period could be reduced. The cleanliness of the battery is a considerable technique to opt for its maintenance and it should be done. Scientifically, when residues form on the top surface, an electric circuit develops between the +ive and -ive terminals within the battery there by tending it to discharge. Cleaning of the poles at least annually with a wire brush and greasing the terminals stops oxidation. You should check the battery case properly once in a year. Keeping the battery safely in a battery box on your boat brings a higher level of security for both you and the battery. At regular intervals you have to perform “equalizing”. This is a special process done by applying a low current for a longer period of time after finishing usual normal charging. The cells of the battery should be kept in balance so that they could perform equally while in use. When boating season comes, this equalizing process should be adopted as part of weekly maintenance schedule. The full charging process should be done at least after every three weeks. You are advised to connect a low voltage disconnect device in the power circuit to ensure safety of the equipment. This device disconnects the battery automatically from the circuit when the voltage drops below the safe level. Use of battery with an under voltage state reduces its life. To increase useful life it is better to purchase a battery of a size larger than the nominal size required. When you purchase a battery be conscious about its quality. Always perform maintenance in scheduled time to get its useful life period more and to save your money. Be particular about using a deep cycle battery charger specifically designed for it and remember even a new battery need to be initially charged and get checked up before connecting to the system. If you care properly your deep cycle battery provides about 15 years of good service and keep you comfortable during its service.